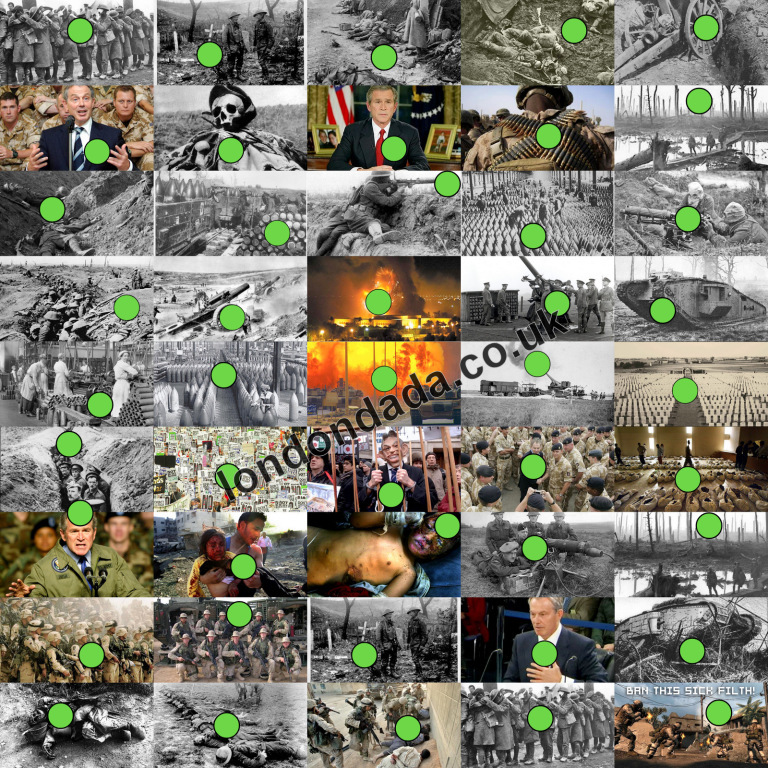 Digital collage featuring images from WW1 and the Iraq war impregnated with green holes, green being the opposite (contrasting ) color to (blood) red; symbolizing the acute need for radical change in consciousnesses in humanity; for each individual to be shot with “bullets of peace”. Dada was founded in Zurich in 1916 essentially as a protest movement against the horrors of World War 1 – a totally unnecessary conflict, killing millions and sparked by corrupt politicians brainwashing the masses into active participation. By-passing WW2, a war that was legitimate of course in that Hitler was aggressively threatening the entire world…and on to the Iraq debacle that had strong echoes of similar pointlessness and mass destruction as WW1; precipitated by two cowardly and despicable leaders backed by morally bankrupt Parliamentary / Capitol Hill MPs / Senators – each one shamelessly motivated by unspoken promise of personal career-advancement. Here, in this penultimate Work, Dada goes full circle; back to its core roots of anti-war expression, with almost 100 years now gone by and sadly with addition of the heinous war crime that was the Iraq invasion. Comment; We either piss against and turn our backs on the Multinationals’ uncaring monolith of power, or become plantation wage slaves with no human rights or dignity.